In the search for chromosome abnormalities prior to the birth, the karyotype (arrangement of the chromosomes of a cell according to a standardized method) is determined in cells of the unborn child that are found in the amniotic fluid. This examination is indicated in all cases with an increased risk of abnormalities, such as maternal age over 35 years or abnormal early ultrasound. With this test, in which special color techniques are used, each chromosome exhibits a characteristic band pattern, enabling the determination of a karyotype. If perceptible with a light microscope, the karyotype can show whether there is a numerical abnormality or structural abnormalities. To search for chromosome abnormalities shortly after birth or at a later stage of development, the karyotype is determined in lymphocytes (white blood cells) which are found in peripheral blood. For the chromosome analysis of certain leukemias the bone marrow is investigated to locate very specific chromosomal abnormalities. 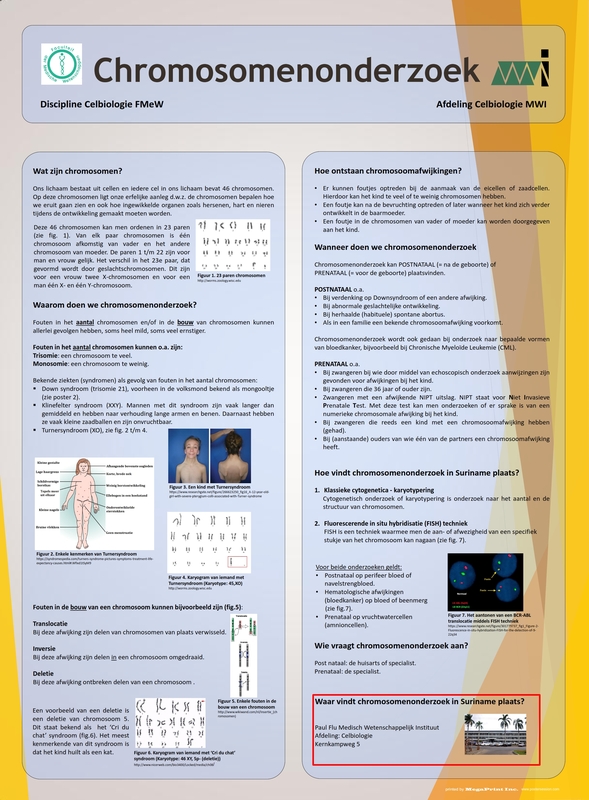 Confirming the chromosomal abnormality is important for the therapy and for the monitoring thereof. The FISH technique can be used for finding chromosomal abnormalities which are difficult or impossible to recognize with karyotyping. This technique can also be used if there is insufficient time to bring the cells in culture. In this technique, chromosomes are provided with fluorescent labels and examined with a fluorescence microscope. In addition to the chromosome analysis, also diagnostic tests are carried out that can detect the presence of auto-antibodies. These tests, which are used in the diagnosis of auto-immune diseases such as Lupus Erythematosus (LE), the Anti-Nuclear Factor (ANF) test, and a direct immunofluorescence test on skin and kidney biopsies. 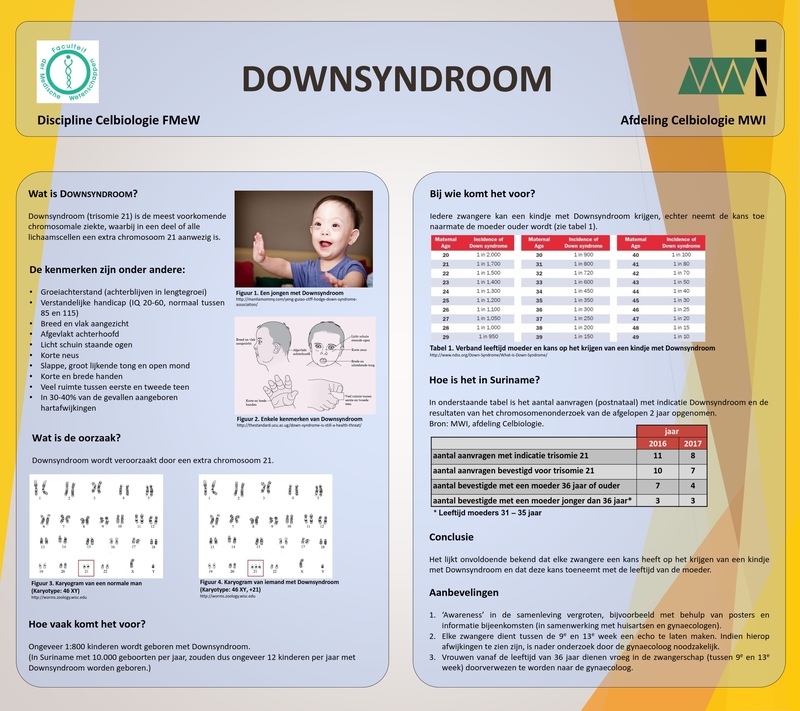 MEER INFO OVER DOWNSYNDROOM? Klik hier om de poster te bekijken.